By Álvaro Díez - PhD candidate and Bogna Haponiuk. Octagon definition: How many sides does an octagon have? Octagon angles: What is an octagon? 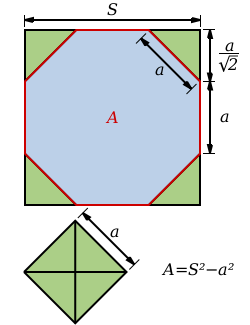 Area of an octagon: How to find the area of a regular octagon? Octagon shape: How to draw an octagon? We introduce the octagon calculator, the ultimate tool for everything that concerns octagon. In this web page, you will find a great tool for calculating the diagonals, perimeter, circumradius, inradius, and area of a regular octagon. 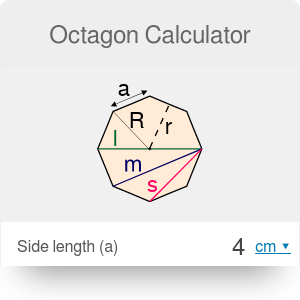 In this octagon area calculator, you will also find all the information to answer the questions: what is an octagon, how many sides does an octagon have, how to find the area of a regular octagon or how to draw an octagon. We will review the octagon definition, explain the octagon angles and how they affect the octagon shape. On top of all that we see a few examples of real-world octagons including octagon tiles and flooring and the famous "Octagon house"". The standard definition of an octagon goes something similar to: "An octagon is a polygon with 8 sides delimiting a closed area". For anyone with basic notions of Greek this will be almost obvious and could answer the question how many sides does an octagon have without any notions of Mathematics. That is because "Octo-" in Greek means eight, so it is safe to assume an octagon has eight sides, or that an octopus has eight legs. We will dive a bit deeper on the Greek origin of the octagon shape when we talk about the octagon angles, but for now, let's stick to octagon sides for now. If someone asks "how many sides does an octagon have?" the answer is always the same, but if they ask about the length of those sides, there is not one answer we can give. An octagon can have every side of different length and still be an octagon, there are no restrictions there. However, when the octagon has all side of the same length and the same internal angles, it is called a regular octagon and has special properties as we will see in the following sections. If we look at the origin of the word "Octagon" it comes from the Greek meaning "eight angles". It means that polygon is composed of eight vertices joined by straight sides. As a necessary consequence of having eight angles, an octagon will always have 8 sides. In fact, the standard octagon definition defines the octagon as having eight sides rather than eight angles, but you already know that both definitions are virtually the same. So the question what is an octagon? is equally well answered by saying "an eight-sided polygon" as well as "a polygon with eight angles". 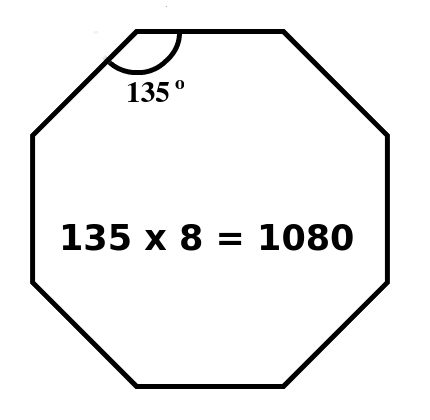 While the sides of an octagon can have almost any length, the octagon angles are restricted. There is not a restriction imposed on each of the angles but on the sum of all of them. 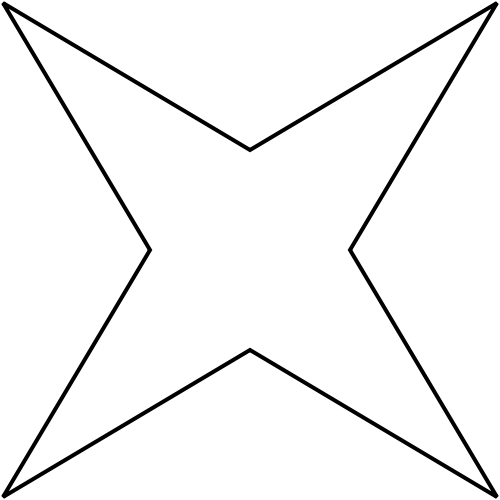 This is a geometrical restriction since it would be impossible to join all eight sides together without following this rule. For all octagons, the sum of all its internal angles is always 1080°. This means that a regular octagon will have internal octagon angles of exactly 1080°/8 = 135° (if you prefer other units, feel free to use our angle converter). In our opinion, a regular octagon is much prettier than any other octagon. In the further text, we'll see how to get the area of an octagon and the tricks that can be used with a regular octagon. where the apothem is the distance between the center of the polygon and the mid-point of a side. The perimeter can be calculated by summing the length of each side, multiplying the length of one side times the number of sides, or, if you're feeling lazy, you can also use our perimeter of a polygon calculator. area of octagon = 8 * base * height / 2 = perimeter * apothem / 2. Calculate the sides of the right triangles either using the 45 45 90 triangle calculator or the fact that they are right isosceles triangles, and use the special right triangles calculator. Alternatively, you can use a trick. If you organize the right triangles correctly, you can construct a square from all four of them. In this case, the side is the hypotenuse which is also the side of the octagon. Then you can calculate the area of the parallelogram you just made from the four right triangles, and subtract it from the area of the big square. On top of these, you can get even more creative. For example, imagine the octagon as being composed by a rectangle with two trapezoids, one above and second below the rectangle. In this case, it will be much easier to calculate the area, since you only have to sum up the area of the rectangle plus twice the area of a trapezoid since both trapezoids are equal. Long diagonals, for example, AE or BF. Long diagonal f = a * √(4 + 2√2). Or if you're feeling lazy or find yourself in a rush, just use the octagon calculator. We should also talk about the circumradius and the inradius. Our octagon area calculator is capable of finding the radii of the circumscribed and the inscribed circle. It might seem easy to draw an octagon at first, and in principle, it is. Just draw any shape with eight straight sides and you're done. But normally, what people want to draw is not any octagon, but a regular octagon, since its is the octagon shape most people think about at first. So let's see now how to draw an octagon as regular as possible and as easy as possible. The most precise way would be to use proper drawing tools and start drawing the regular octagon shape one side at a time, joining them with the corresponding 135° regular octagon angles. But not everyone has such tools laying around so it is not a very practical method. To obtain the octagon shape, we are looking for, you should better start with a circumference, since it can be drawn by hand (not recommended) or using a glass, cup or even a coin. With the circumference drawn, start dividing the corresponding circle area into halves. First, you will make two half-circles. Then, divide them in half again and get four quarter circles. One more halving and you end up with eight circle-eights. We can now take the points of division along the circumference and join the adjacent ones with a straight line. The result is a perfectly regular octagon, minus the human error you make whilst drawing and halving. Another trick on how to draw an octagon would be the one we have already seen when learning how to find the area of an octagon with squares. Start by drawing a big square and then 'chop off' the corners of it. The mathematical term for this procedure is truncate the square. If you do it right, you will get a regular octagon shape out of it. This method is not as precise as the previous one, but it's easier to perform without any tools at all. Using the octagon calculator is not complicated but just in case someone might have any doubts and for the sake of completeness, let's go over the features and use cases of this octagon area calculator. First of all, we should look at the different fields and what they mean. 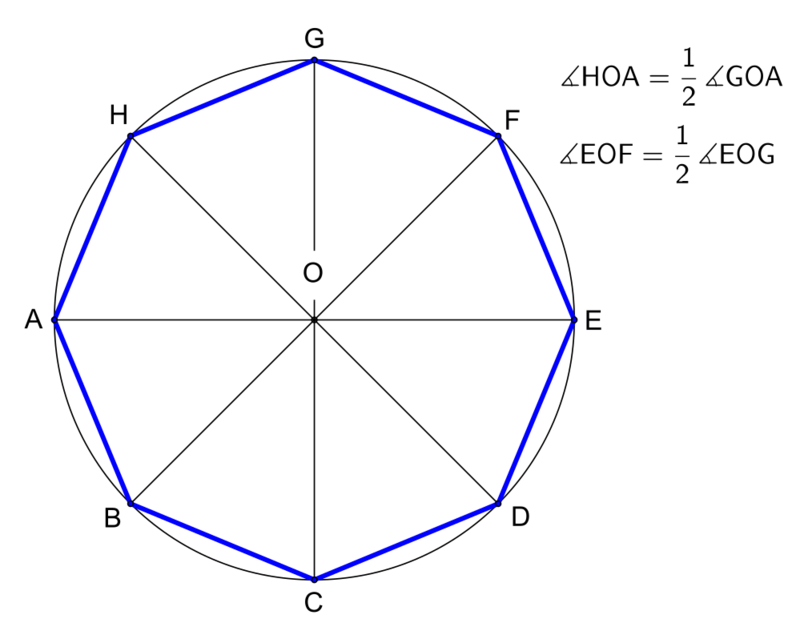 Side Length - It is the length of each side of the regular octagon. Now when you know what each of the parameters means, it is time to see how to use the octagon calculator to easily obtain the values you are looking for. The best feature of this calculator is that it only requires one input to calculate the rest of the values. This makes the octagon calculator the fastest way to calculate any properties of an octagon, by a long shot. So far we have talked about the octagon definition and how to draw an octagon. We've seen pictures of an octagon and even answered the (now obvious) question of how many sides does octagon have. Now it is time to see how octagons are used in real life. The octagon shape is easier to manufacture and design around than a circle, due to the flat sides and the octagon angles. We can find octagon tiles for flooring, or even houses with an octagon shape, most notably the famous "Octagon House". 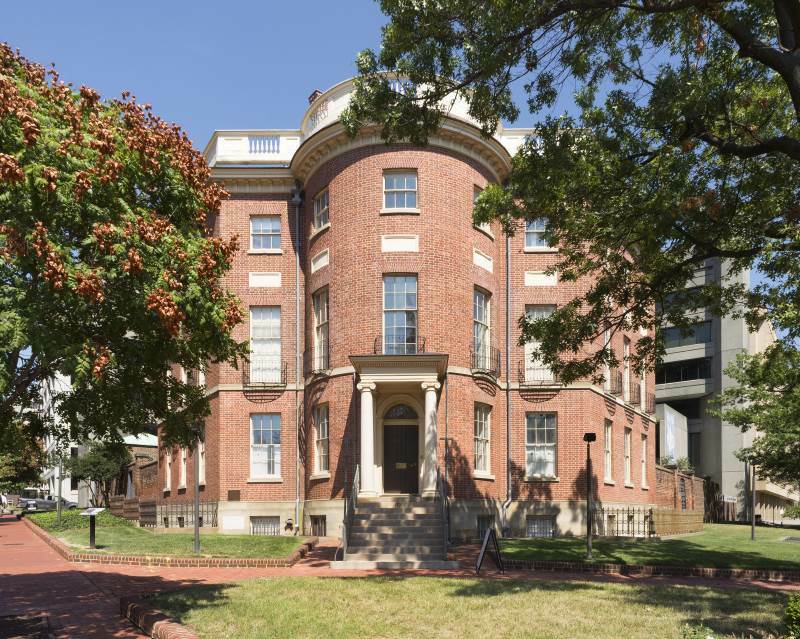 The Octagon House is a house built with an octagon shape in Washington D.C. in the USA. It was built for Colonel John Tayloe III. This is the reason, it's also known as Colonel John Tayloe III House. It follows the American "tradition" of naming buildings after their shape as they did with the Pentagon, which is the headquarters of the United States Department of Defence and was built in the shape of a regular pentagon. The Octagon house has many interesting architectural features such a triangular service stairway, a bigger oval stairway or the obvious octagonal shape of the building. On top of such unique characteristics, there are several ghost stories surrounding the house, partly because the owner was an important figure in the early American history. Like any regular polygon, the octagon shape turns out to be useful in different applications. We have already talked about making houses in an octagonal shape and sticking with buildings, more specifically flooring. Let's focus on the another application: octagon tiles. The shape of a regular octagon means that we can combine octagon tiles and square tiles to completely fill the floor of any room, no matter the square footage of it. Using different pattern in each type of tile, or using different colors, this combinations would allow you to have nice flooring for your kitchen or bathroom. Just remember to use our tile calculator which may be a great help for you! Another interesting use of octagons is inside of photographic cameras. In particular, the shutter that protects the sensor from the light when the camera is not in use. This shutter or aperture is always made following a regular polygon shape, including the octagon shape. You can learn more about aperture and how to play with it to get more professional looking pictures with our aperture area calculator. Álvaro Díez - PhD candidate and Bogna Haponiuk. Octagon Calculator can be embedded on your website to enrich the content you wrote and make it easier for your visitors to understand your message.